This thread shall be a location where those seeking a really inexpensive option for a smooth, easily acquirable substrate on which to paint any number of DIY paint applications. As I'm about to start using the Thrifty White as a base for several different DIY paint applications to be use in a soon-to-come- comparison test, I plan on using this thread to illustrate both Rolling and spraying techniques on this material, it's suitability for each, and the progressive steps it takes to achieve a great finish no matter what flavor or utensil is use in the cooking. To maintain "On Topic" discourse, and prevent trolling and intention disruptions, it's requested that all posting be limited to directly addressing questions on the material itself, how to go about coating it, and any reports as far as end results that any who acquire and attempt a project should produce. 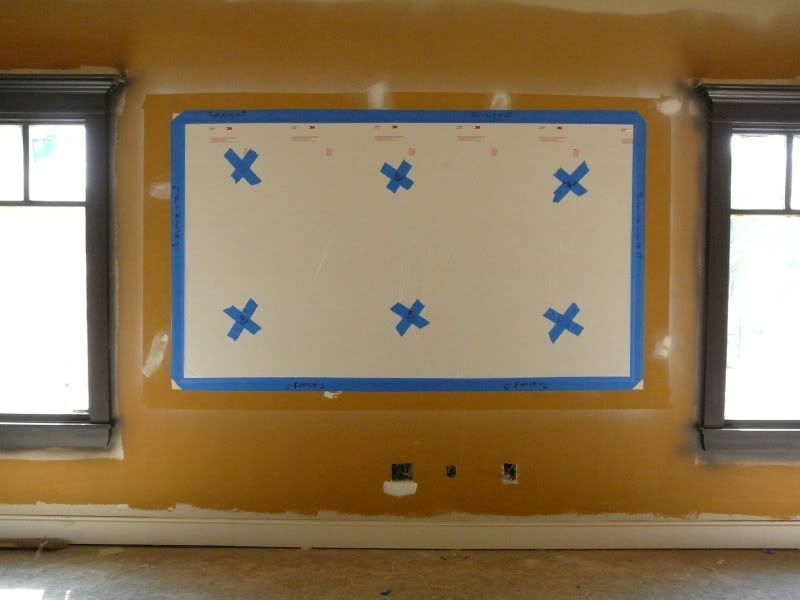 As shown above, a bead approx 1/4" wide is applied every 2" from top to bottom, then trowled out so that the adhesive covers every bit of the rear surface, or all of the area lying withing a boarder marked out directly onto a wall. The size show requires approximately 3-3/4 tubes @ $2.39 per. A "Floor Adhesive Trowel... 9" Rectangular with medium to fine points is adequate to the task. This next photo shows the TWH from a left side angle, clearly providing one with an idea just who reflective the surface is. 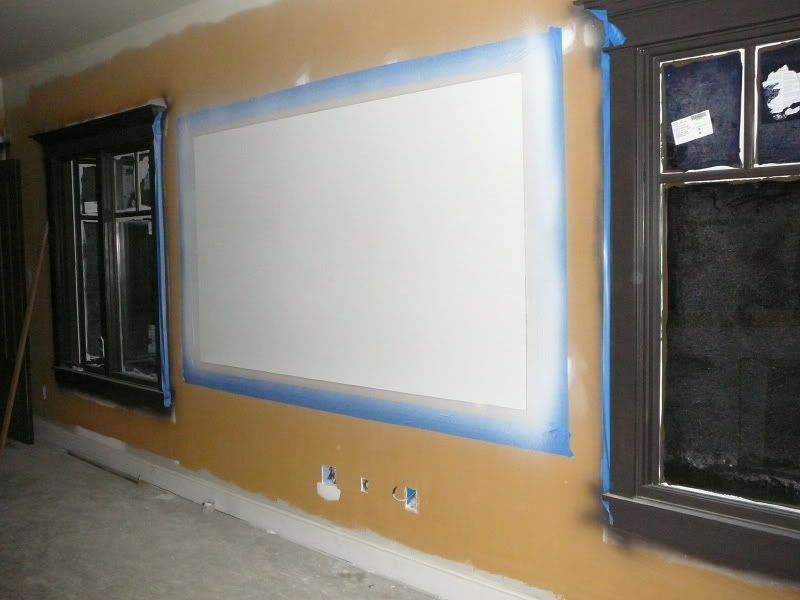 The room show was getting very dark, and light was at a premium, but still you can clearly see the reflection of the side walls and white primed trim within the surface area of the TWH. Next is a Photo taken with a Flash from the Right side, at an angle that prevents too much of the TWH's reflection from becoming evident, yet shows the bright white properties it possesses. The following image shows the amount of reflectivity of the TWH under a forward directed Flash. Not quite as much reflectivity as a Mirror, but certainly more than any painted "Gloss white' surface can manage. And also, one can note that the reflection of the flash is very precisely outlined. This will work to a great advantage when the proper amount of overlying paint attempts to mute, yet utilize the TWH's reflective properties. Next up....., Rolling and Spraying on a smooth, slick surface. .......waiting for the first Silver Fire HG coat to dry as I peck this out, so I can take the first of several comparative shots of how each of the various DIY paints being covers a sheet of TWH with each layer. After "shooting" , I'll be "squirting" the 2nd coat, and then retiring for the evening. It's been 25 minutes since I droped the Wagner. OK, after 40 minutes I applied another coat at a slightly slower speed than the rapid dusting I did on the initial coating. The TWH has a very smooth, slick surface that is almost identical to the touch as a Acrylic Mirror, so a ultra light "dusting" that is let to completely dry effects a "Toothed Surface" for the heavier (...as in light coats...) applications to follow. In this next series of Photos, you can see how progessively dimmer the camera's Flash has become with the second coating. The third coat. I'm not trying to cover the screen very quickly, preferring to be certain that each coat is very equal t the last before it. But even so, you can clearly see the reduction of the Flash's intensity. Here is a Video of me applying the Forth coating. This coating was applied at what I feel is a "slowest normal speed" for the Wagner with such thin paint. I wanted the 4th coat to effect final coverage because I wanted to get the surface finished so I could then mask it off before I left the room to the auspacies of the Room Painters that will follow. Please excuse the Video image that keeps going in-out of focus. I still have to find a Focal metering setting that remains consistant, but between the "Fuzzy" parts, you can get the drift. And now here are images of the completed screen. Today marks the beginning of a 4 sheet spray project with Behr SS - Misty Evening -FnEasy 06 w/ UPW Exterior Primer - and SF (basic) all being squirted on 4' x 2' panels for the up coming Contrast Comparison Tests. Last chance for anybody to suggest anything else that can be cobbled together from HD/Lowes inventory. BTW, above are the latest edits for this thread. From this video it would appear that you are holding the wagner only about 6" from the screen surface, is that right? Nope. 10" to 12". Any closer and the Fan Pattern would be greatly reduced, and the amount of paint hitting such a restricted area would be too heavy at the low viscosity used. You'd have to really move all the much faster. As previously stated, the video shows the last coat going on, and because the prior coatings allowing such, I slowed down to about 1.5 foot per second to be sure I'd not need to do another coat. For a beginner I still suggest stretching out the coats to 1 "Duster" for a primer, and 4...maybe 5 thin coats applied at 2 ft. per second. What I do without "thinking" you should instead "think about" and if you are to err, do so on the side of caution. It might take a little longer, but nowhere near as long as starting over. I know your going to prime your wall with Kilz2 "Golffnutt, so in your case, you don't need to "dust' as much as simply observe a even, 1.5' per second pace and a 50% overlap. you'd be hard pressed to tell that your silver fire screen wasn't white (before being projected on)... unless you had a white reference next to it. Are you one of those guys that paints your house every 3 weeks? My Uncle has the same wall paint in parts of his house since 1957! I'm using a optoma panoview matte white screen and i'm very unhappy with the overblown whites and the waves. I started using the $10 board and rolling Behr SS it was a small screen at the time, until i got my free screen for my DV10, they did not give me a Greywolf II, just the cheapy matte white. 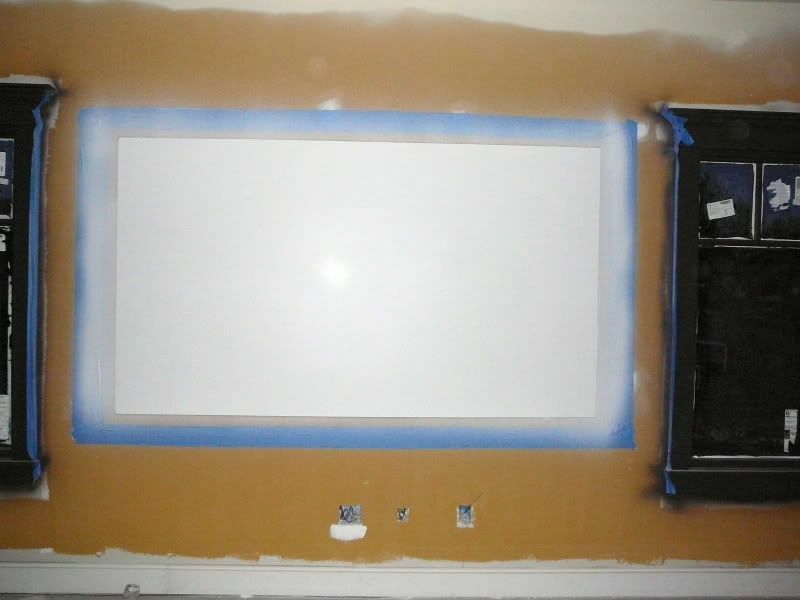 I want a grey fixed screen but dont want to spend hundred's either, thru your reading i'm going back to a DIY solution, i'm not spraying either, i'm a auto tech with 3-4 spray guns in my garage, but i'd rather roll it. Mississipi', is the board brown on the back? and white semi gloss on the front? Home Depot's and Lowes here do not sell Parkland , theres a board they use in bathroom walls thats rough on 1 side and flat on the other, it sells for like $30 and i would assume thats "Parkland"
MM man you were reading my mind, I saw this board at HD yesterday and though it would make a great screen foundation..
My curent screen is masonite board which I rolled (poorly) with Behr "sterling" and matte polly top coat, I'm happy with the colors and contrast but feel the texture and picture could be better..(hd1000u) total light contol room..
What type of surface prep did you do before the first coat, and are you using the new hvlp wagner gun? Last yr i used this board, was looking for Parkland, so i settled on it, was $9 at the time. 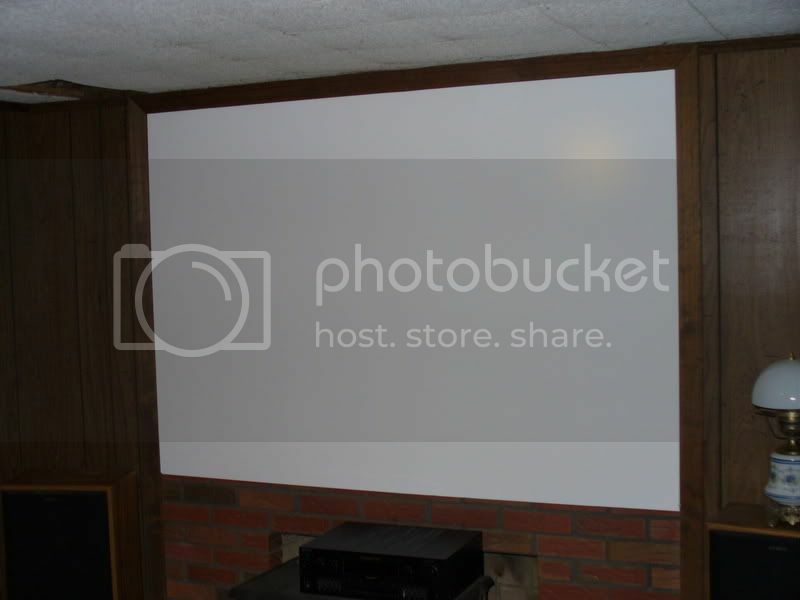 HD would not cut it as i think i wanted a 65"x45" at the time to fit in my brick fireplace wall. Did you paint the white side right? 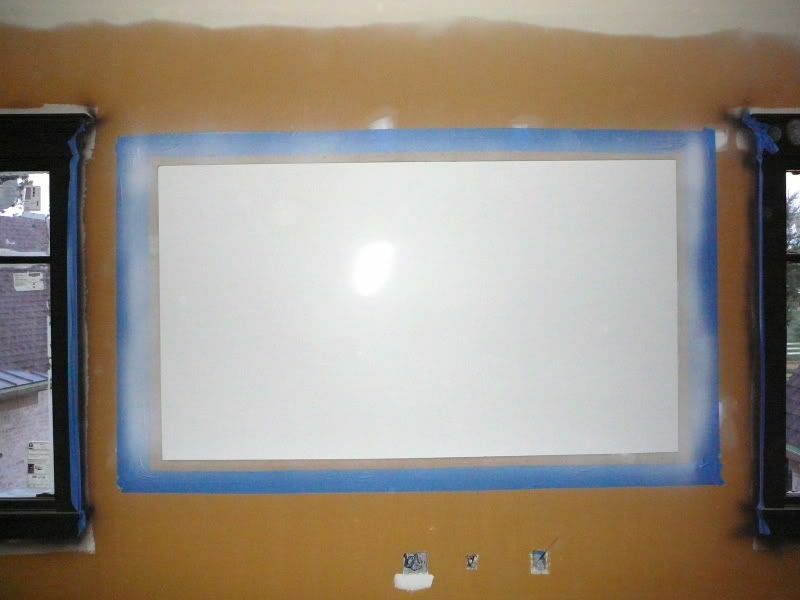 Here's a pic of my first DIY screen using just Behr SS paint last fall, was up for a week top's, till i got a Panoview which is hanging now. For 20 yr's my cellar was just a place to store junk, till i got into PJ's late last summer. My wife wanted to paint the 1970's dark paneling white, THANK GOD we never did!! The dark walls and light controlled celler proved a great place for my ceiling mounted HD70. Now i have to finish off the other half for my son's game room and maybe hang a plasma or lcd for his 360. I used thes same substrate for a DIY screen a couple of years ago. I was not sure if I could paint it without primer first so I primed it to be safe. I didn't get an even coat with the primer, but thought the top coat would cover it so I went ahead and sprayed three coats with a mixture of pure white, pearlescent an a bit of SM. I guess the translucent nature of this mixture was not suitable for coverage. I have been satisfied with the results for the most part, I can only see the inconsistency when there is a pan of a solid color across the screen, nobody else can see it of course Anyway, I just purchased an Epson cinema 400 and am itching to build a new screen. I was planning to go with the screen goo digital grey, but thought I would check in to see what the Mississippi man was up to. I only have a lowes and sherwin williams in my area, closest Home Depo is 3hr round trip, but am willing to make the drive if needed. What would you suggest as the closest match to the digital grey, or should I just go ahead and cough up the $120 and be done with it? I used the same substrate for a DIY screen a couple of years ago. I was not sure if I could paint it without primer first so I primed it to be safe. I didn't get an even coat with the primer, but thought the top coat would cover it so I went ahead and sprayed three coats with a mixture of pure white, pearlescent an a bit of SM. I do not prime the surface using other applications than the extremely thin S-I-L-V-E-R mix, opting instead to build up my Top Coats gradually using the Wagner I now employ. I'm about to try a screen of TWH coated with S-I-L-V-E-R directly, but I cannot as of yet advocate that course of action for anyone else without adding that if done in that manner, each of the first two "Duster Coats" would have to be absolutely dry before the following coats were applied due to the slich surface of the TWH. Otherwise, with your current screen, a light sanding, and then three well applied Primer Coats of Kilz2 will get you well started with a high degree of confidence in your end results. You do not say if you sprayed or rolled the primer, but if you sprayed I'm betting that you did not thing the Primer enough. Over the years I was never an advocate for thinning paint with water, believing that do such would ruin the properties of the paint. Not so. The water evaporates out upon drying, leaving the paint behind (...a real case of "Duh", eh?) What thinning does do when spraying is allow you to lay down a considerable amount of material...but you have to increase your speed across the surface, and overlap each row by 50% while doing so. You just hit each row once, move down, repeat going the other way, move down...etc. You DO NOT return over a previously painted area coated with a thinned mix or you WILL get a Run or Sag. Spraying Primer is the same as spraying a regular paint. It may take 3...or even 4 sprayed coats to effect a even coverage when thinned, but the resulting surface will be very smooth and very consistent in coverage. The type of Spray apparatus your using (...and Tip size) will dictate both the method of application as well as how thin you must make the paint be. I guess the translucent nature of this mixture was not suitable for coverage. Certainly not with three coats. I have been satisfied with the results for the most part, I can only see the inconsistency when there is a pan of a solid color across the screen, nobody else can see it of course Anyway, I just purchased an Epson cinema 400 and am itching to build a new screen. I was planning to go with the screen goo digital grey, but thought I would check in to see what the Mississippi man was up to. I only have a lowes and sherwin williams in my area, closest Home Depo is 3hr round trip, but am willing to make the drive if needed. What would you suggest as the closest match to the digital grey, or should I just go ahead and cough up the $120 and be done with it? Not a chance. The GS Digital Gray is pretty ordinary without their Top Coating. (...and not really a "Wowser" with it... ) Your obviously not talking about buying a complete Kit or $120.00 wouldn't begin to touch the cost. You can do a WHOLE lot better for a lot less. First you need to consider your substrate. Are you going bigger? Or can you use the old screen as your new surface? If you can do the latter, you almost already there. I cannot attest as to if either of the two stores closest to you have a product similar enough to the Behr Faux Glaze to assure you the identical results you'd get from S-I-L-V-E-R, but I do know they do not carry any Silver Metallic along the same lines as the Delta brand found at Art Supply / Craft stores such as Michaels. If you want to do it, let's be sure you do it right, start to finish. Get the suggested materials....no substitutions. The formula is a proven application. experimentation is fraught with uncertainty. DIY can be all about experimenting if one has the stomach for failure and re-doing things. To me, I'd say your more than anxious to get back to watching "The Big Picture", and this time, you can get some "Jaw Dropping" results YOU can be proud of. What spray rig do you have? What size are you wanting to go with? Can you reuse your current surface? Is you car tuned up? ..and last of all, are you ready to get leveled by your end results? I have an Ingersoll Rand 210G gravity fed spray gun with a 1.4mm nozzle, and a 30 gal. 5hp compressor. I can dial in the output pressure from the compressor, but don't have one on the gun. I am debating on either 98" 16:9 or making it wider and zooming in the projector for the 2.35 format films. I just don't want to give up the 48" heighth so it will not be an actual constant heighth screen if I go this route. I plan on using a new piece of panel for this project and hopefully selling the Sanyo Z2 with the other screen to recover some of the money I spent on the Epson. My car is good to go, the closest metropolitan area to me is Paducah, KY and they just recently had a Michael's open up, I noticed it last time I went there. So, with a little driving, I have access to Michael's and Home Depot. I guess I will need to call and make sure they have what I need to get before I make the trip. On the last project I used the Behr Pearlescent from HD and some american tradition silver metallic faux glaze from Lowes. I still have half the former and most of the later left. They didn't have the behr silver metallic at the HD at the time so I had to improvise. With the S-I-L-V-E-R mix can I just paint 7 or 8 light coats on top of the new panel or do I need to prime and paint an undercoat first? What ratio would you suggest the ingredients be mixed at, having trouble finding the formula between all the off topic posts in here. I can't wait to be blown away by the results! And BTW the $120 for the Goo was: $45 for 1 litre of the base coat and $75 for 1/2 litre of the top coat, read somewhere that it should be enough to do a screen of this size. I figured if I needed more top coat I could just order another 1/2 litre later. Oddly enough, I hit on this possibility last summer only I did not paint it. I was going to try it straight up and see what I got, obviously that didn't work out too well. I glued the old "shower surround poly wall" stuff to it and damned if it wasn't bright enough for daytime viewing with some serious ambient light. At night, or in light controlled conditions, the thing could light up the room enough to read by and it didn't hot spot. The poly seemed to prevent that for some reason. I've been reading through the Silver Fire section, but am beginning to lean away from paint at all. I purchased the Wagner Control Spray and have been both disappointed and impressed depending on any number of different conditions, paints and surfaces. 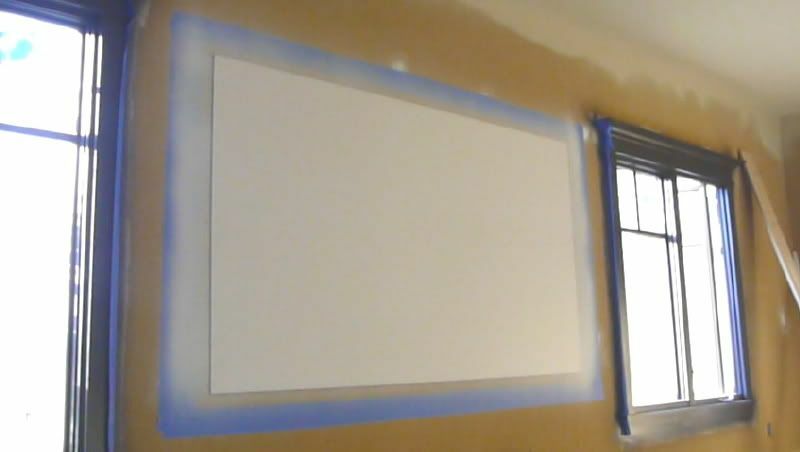 I am seriously considering foregoing the paint entirely and just using a poly wall over the aforementioned white board. Only this time I can trim it out properly in black velvet. Previously, the screen sat on a table and was not even trimmed to fit. Get a Regulator valve for the Gun. That allows you to set Hose pressure at 70-80 psi, and Gun pressure at 40 psi. That results is a far more consistent air supply that lets you know sooner when you've bled the tank down below 50-60 lbs with constant spraying. I am debating on either 98" 16:9 or making it wider and zooming in the projector for the 2.35 format films. I just don't want to give up the 48" height so it will not be an actual constant height screen if I go this route. 98" 16:9 is my strong suggestion. You'll miss the vertical size otherwise. I'll post the Home Depot SKU number for the TWH very soon. I'm about to do exactly that....but that's me and I'm well known for just "Doing it". Here's the logic. 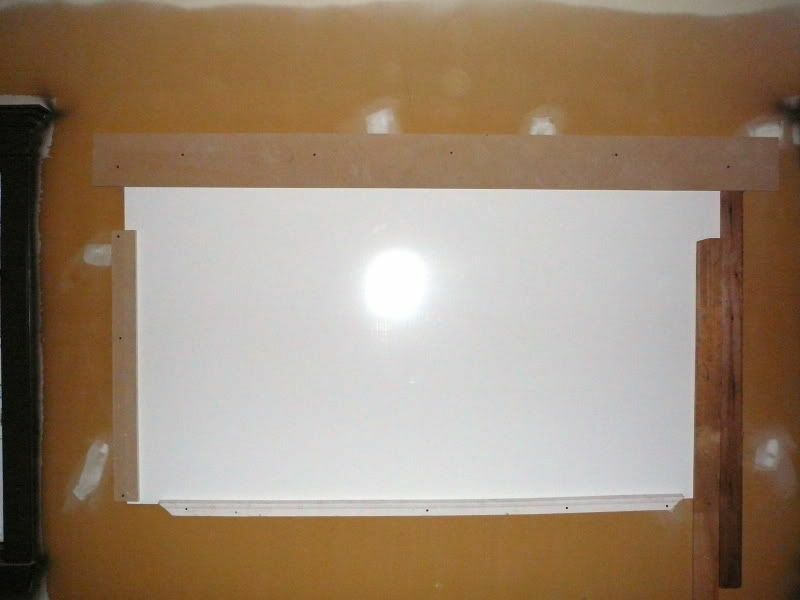 The Thrifty White is a almost Glossy White Vinyl Coated board. If you rub your finger down it, friction drags on it quickly. To me that means that surface will accept any water based latex paint. Goodness knows it accepts primer easily enough. The Kilz2 is there to provide a great, Bright White base for the S-I-L-V-E-R to overlay, and in fact does help the S-I-L-V-E-R to adhere than it would out of hand on the Thrifty White starting out. But ONLY to the extent that one would then have slightly more leeway in applying the first coat, allowing for a little bit heavier "Dusting" without a drip or run forming on the smooth surface. If you dust properly and evenly using a Gun like the IR-210, the first coat will dry pretty quickly and then you have your "primer" that will hold the next "Duster' coat. More relevant is what the difference between starting out with a fairly glossy white Substrate as a Base would be against a base that is a bright but Flat white hue. I can easily guess that even more gain will result if one does not cover to the necessary extent to equal what is accomplished using a Flat White. I substituted Delta Silver Metallic for the Behr SM because I wanted more gain and that is exactly what I got. Using a primed white Flat hued surface. Will the "Gloss" make even more of a gain difference? With the Delta I'm sure so. Will it be "too Much?" Probably not, but I'm not much into "probables" when 1500 lumens are being used on a 98" screen. If you went back to using the Behr product, I'd say it would not. ..and with that being a pretty light mid-Hued Gray base, you'd then shoot the "Delta-Based" S-I-L-V-E-R onto that in 7-8 "Dusters". With the Epson 400 set to High or Low output, the result will be some very enhanced Blacks, as well as some very white whites. And the Gray base will serve to enhance ambient Light potential more so than a White base. That, and effectually prevent any overt chance of Hot Spotting. Well, with that info, and knowing your Gun's potential, if both the materials were thinned to the right consistency, you could get the job accomplished. But barely so as far as the Top Coat, and not much ahead of the Base Coat. Nothing much to practice with though, and certainly none for any mistakes. Let me clear....GOO is a quality paint, and done correctly provides a very good surface, Spraying it "rightly" assures the best possible results. With the Epson hitting just 98", I guess you'd be happy enough.....if you nailed the application process. It's really your call. Myself, I'd opt to utilize those lumens and use a application that would take my perceived Contrast out beyond the 400's 6000:1 ratio. Contrast is King when detail and "PoP" is to be be considered attributes to strive for. 24 Oz. Dstilled or Filtered Tap water. Pour all into clean new gallon can and power mix with a Squirrel Cage Drill Mixer. Move across the surface at 1-1/2 fps minimum, maintaining speed and distance. Overlap top of screen and each row by 50%. If possible, be sure side and top edges are against a paintable surface to avoid "Vortexing" when you run off and onto the edges at the end of ar start of eash row. You should hace enough "side and top" masking that you can in fact run off about 6" and drop 50% then start back across. Easy stuff, eh? Well for a "Old Hand" with a Ingersoll Rand and 30 gallons of reserve....it should work out to be. Oh yeah...with that rig, you WILL need a Water/Rust Filter. A Poly-Glaze like S-I-L-V-E-R won't suffer "Fish Eyes at all.....and any dirt or rust that hits that bright silvery white surface will not only stand out like a blood stain, it will ALWAYS happen on your last coat! Well, lean backwards and do it under the right conditions and using the right paint at the right viscosity and with the right procedures....and your end results will be.....well, righteous. Silver Fire will really give you stellar quality Blacks and great Ambient Light viewing. S-I-L-V-E-R will also deliver stunning CR, but only in more light controlled situations. In such, it creates a "Light Fusion" effect not previously seen without the use of a painted Mirror. 3-D'ism is absolutely intense. You got the Gear and the motive. Take the step. You'll be much MO Gladder'er ya did. Thanks for the advise Mississippi, I will be gathering my supplies this weekend, do you plan on trying the base TWH w/S-I-L-V-E-R before then? Would like to see how your results are before I try, or else I will just go ahead with the primer as you suggested. I plan on painting in a spare bedroom as my storage building is rather full atm. Do you think I will need to cover all the floor in the room or just the immediate area I will be painting. Room is 12x14 hardwood floors, I plan on painting the walls in the near future. Edit: Just thought to ask the about primer, you mentioned to add 030 lamp black and 010 yellow oxide, is this for a quart, or gallon? I am actually leaning towards the S I L V E R now that I have read up on it. For where it has to go though, no mdf due to weight concerns. Old plaster walls, over the old fireplace, etc. 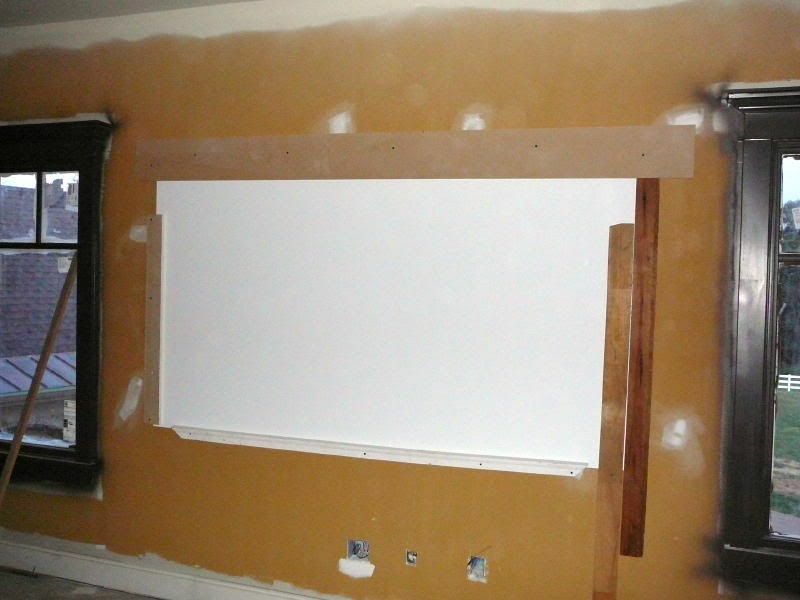 Same thing means I cannot paint the screen in here, but there is a basement that may work out. Have to see. I do like the Wagner, it's just difficult sometimes to get the correct thin mix. Ya know, I say that but the fact is, I've painted probably 500 linear feet of trim, 8 doors, kitchen cabinets, floor and heat grates and vents and one metal cabinet. In all that time I have 1 run so far and I knew when I did it that the mix was a little thin. Thanks for the advise Mississippi, I will be gathering my supplies this weekend, do you plan on trying the base TWH w/S-I-L-V-E-R before then? Do you think I will need to cover all the floor in the room or just the immediate area I will be painting. Room is 12x14 hardwood floors, I plan on painting the walls in the near future. Quart .........x4 for a gallon mix. The Thrifty white is almost rigid enough to stand up on it's own, but with a attached ring of 1" x 4" (...or 1" x 6"s) it will set up where you want it to, and be just a little over 20 lbs total. Practice (...and experience...) makes all the difference. I was at Lowes getting a few things today and found some 1"x4" flooring for $5 in 8' lengths. These have a tongue and groove and the TWH fits snug inside the groove. I think these will make a great border and allow me to get the most out of the screen surface as this will only cover about about 3/16" around the edge. The boards are also very straight and have better asthetics than a plain 1"x4" plank. I just thought I would suggest this to anyone looking for a boarder for their TWH screen project. great find and good sleuthing !! Please tell me extents on this screen length and height. Are you gonna rip the outside "tongue" off by cutting the width down to 2-1/2" to 3"? Wrap the board with Black Velvet material? If you use the Triple velvet, even when it's stretch across that groove, you'd be able to push the TWH down into it enough. But my main concern would be that the "groove", being centered on the T&G's edge, will stand off the rear wall by a small amount, necessitating that the screen area be 'shimmed out' a corresponding distance lest the edges bow out slightly. I'll tell you the truth, you'll be hard pressed to find and use a better material than the 1/2" x 3-1/4" MDF Base Board, and just Butting the wrapped edges against the TWH. That T&G flooring will be a buggar to drive a nail through, and I know each piece will wieght 2x+ what the MDF will. Still....if you go with it, and it works.....that's what will matter. Good luck in that. I have a chair rail that goes around the wall, and have wallpaper top and bottom. 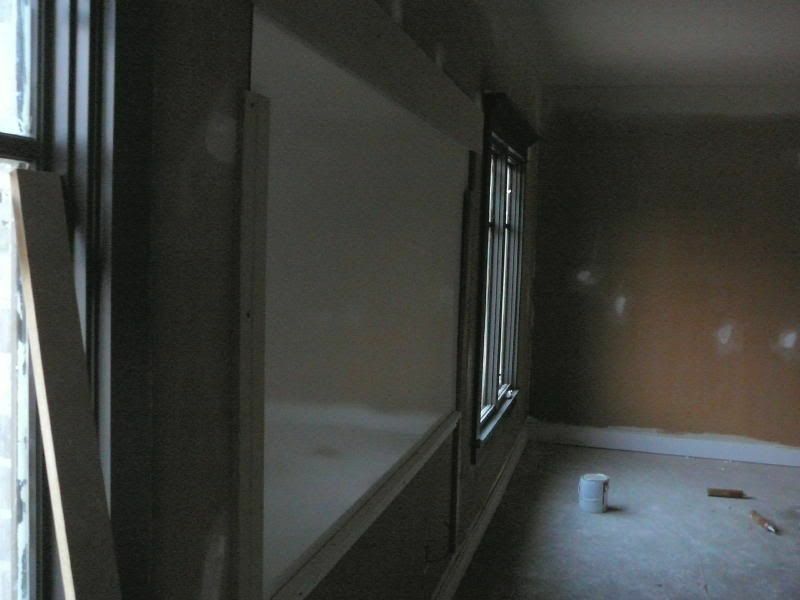 In order to make the screen flush I would have to cut out the rail, I may want to sell this house so I am trying to keep alterations to a minimum, or I would just tear out the wall completely and start from scratch. I currently have 2 6' 2"x2" 's attached horizontally that stand the screen off from the wall. I was planning on ripping the flooring to 2 1/2" and painting it a flat black, didn't think the velvet would allow room for the screen to slide into the notch. I was actually looking to use the 2" velvet tape, but what I found is a little pricey, still looking. I bought the air filter, and pressure regulator for the gun as you suggested. I may mix up the silver and practice on the old screen first, do you think the mix will be enough for two screens, one 92" and the other 98"? Is the triple velvet you speak of from denverfabrics.com ?